Tuscany has one the most enchanting landscapes in the world most recognized by soft rolling hills, characteristic cypress trees, legendary Chianti vineyards, olive groves with ancient gnarled trunks and silver-green leaves, ancient farmhouses and medieval hilltop hamlets. Tuscan wine and cuisine are legendary worldwide. On this Stefano Rome Tours day tour and shore excursion you will discover some of the most beautiful places in Tuscany and samples the exquisite flavors of Chianti wine that make this region so enchanting. This tour is available only from Florence and Livorno Cruise Port. Your English speaking driver will pick you up at your accommodation at 9:00 AM, and your day will begin with a relaxing drive through the Tuscan countryside to your first destination. Your English speaking driver will meet you next to your ship holding a sign with your name at 8:00 AM, and your day will begin with a relaxing drive through the Tuscan countryside to your first destination. Nestled in the heart of Tuscany, Monteriggioni fulfills one’s imagination of what a Medieval walled village would be like. Perfectly preserved, when you set foot through its entrance gate you find yourself stepping back in time to early 13th century when the Sienese built this hamlet as a strategic military fortress on the border of their arch enemy, Florence. .The roughly circular shape of the town actually follows the natural contours of the elevated ground upon which it was built. The fortified walls total 570 meters in length with 14 towers and 2 gates: one facing Florence and the other facing Rome. Monteriggioni was so prominent at one time that the great Tuscan poet Dante Alighieri referenced to Monteriggioni’s 14 towers in his famous Divine Comedy. Historic Renaissance buildings once owned by local aristocracy and a Romanesque church with a simple facade dominate the lovely square. A pedestrian-only zone, the village is perfect for a stroll exploring the charming streets, gardens and small businesses of the town. From here you will head to your next Tuscan destination, San Gimignano: the impressive hilltop town informally nicknamed “the Medieval Manhattan” for the many towers that define its distinctive and unforgettable skyline. 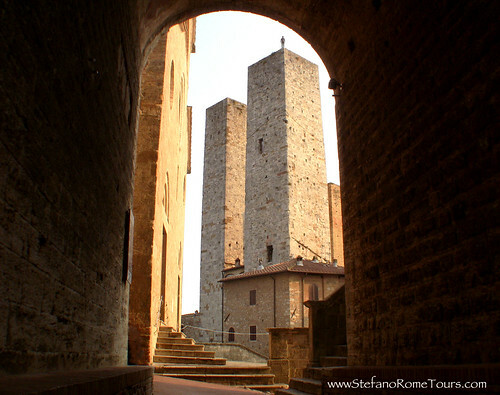 It is also fondly known as “San Gimignano of the beautiful towers” (San Gimignano delle belle Torri). Today only 13 towers stand, a significant decrease from the original 72 that centuries ago graced its skyline. San Gimignano is a distinctive Medieval town whose historic center is listed as a UNESCO World Heritage Site. Its main square, Piazza della Cisterna, is a special treat for all visitors offering a taste of what the town has to offer. A beautiful well on whose steps crowds gather to admire the beauty that surrounds them is the focal point of the square. The square is encircled by eclectic Medieval buildings from various eras, imposing Romanesque and Gothic Palazzi (palaces), and lofty towers. Some of Tuscany’s best gelato shops are located in this square, as well as cafes, ceramic shops, local boutiques and enotecas where you can purchase the famous Vernaccia wine of San Gimignano that has been produced since the 13th century and enjoyed by Italy’s most illustrious among which were Lorenzo the Magnificent, Dante Alighieri and Michelangelo Buonarroti. San Gimigano’s history is as rich as its beauty, and spans across 2 millennia to 3rd century BC when it was once an Etruscan settlement. Later on during the Roman Republic it is said that two noble brothers by the name of Muzio and Silvio fled Rome to this region and built two castles: Muccio and Silvia. 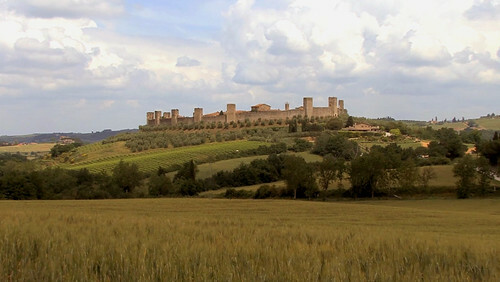 Castle Silvia was renamed San Gimignano in 450 AD when Bishop Geminianus intervened to spare the castle from imminent destruction by Atilla the Hun’s followers. A church was dedicated to the Bishop who later was canonized into sainthood, and a village began to grow around the church and flourished into a developed city heavily involved in the trade of agricultural products such as Vernaccia wine and saffron. Due to its location along Via Francigena, during the Middle Ages San Gimignano became a rest stop for pilgrims who traveled to and from the Vatican. With trade came wealth and well-to-do families of merchants and moneylenders erected towers to establish their economical power. At their peak during the 14th century, 72 towers were erected - the higher the tower, the greater the power. Although other cities such as Florence had towers erected, centuries of war and urban development have more than decimated them. It is astonishing that so many towers have remained erect and so well preserved in San Gimignano. The elegant 17th century Renaissance Tuscany villa with romantic gardens belongs to the Corsini family whose lineage reaches as far back as 1427 when the villa, a fortified tower at that time, was owned by the Corsini family. With much care and dedication, the current Corsini family members have ensured the Villa and the farm estate continue to prosper and produce elegant wines and organic olive oil. This marks the end of your Tuscany and Chianti Wine tour. From here you will enjoy a countryside drive back to your accommodation in Florence or Port of Livorno. Thank you for choosing Stefano Rome Tours for your day tours and shore excursions. We look forward to showing your our beautiful Italy! 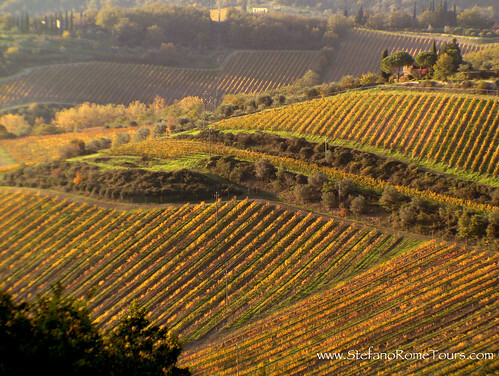 * This tour is available between April and October as most popular wineries in Chianti close for the winter months. * Booking wine tasting, tour and lunch at wineries require advance reservations as availability is limited. The itinerary of this tour will be confirmed once we receive confirmation of availability from the winery. * Included in the price of this tour is a private deluxe vehicle with a professional English speaking Driver, VAT tax, tolls, fuel, parking fees, insurance. * Not included in the price of this tour is wine tasting, wine tours, lunch, and any personal guest expenses. * The price of the day tour from Florence is quoted for pick ups and drop offs at accommodations in Florence. This tour is also available from areas outside of Florence, please write us for a price quote. * Winery Tour, Lunch, Wine Tasting (3 wines) and Olive Oil tasting is approximately 45 Euros per person. .Advanced reservations by us for the winery are required, cancellations must be made at least 7 days in advance. Payment for wine tour and lunch must be made by customer to the winery on the date of the tour. * Payment for the tour will be made in Euro funds at the end of your journey directly to your Driver. You have the option to pre-pay in advance via PayPal. If you wish to prepay in advance please let us know. * Share the fun and the expense with new friends on this Shore Excursion from Livorno by sharing your tour with fellow cruisers for up to 8 guests per minivan! All you need to do is place an ad on Cruise Critic’s roll call with a link to this tour page and invite other like minded cruisers to join you on this tour. * This tour provides an English speaking Driver who is not a Licensed Tour Guide or a Sommelier. Your Driver cannot lawfully act as a tour guide and accompany guests away from the vehicle to sightsee. Experts at Wineries can offer in depth information about wine and vineyards. * Wineries are private estates that may close unexpectedly for private events, weather, or other unforeseen circumstances without advance notice. During such events, the winery will be replaced with another available winery of comparable quality. Please note that Wineries require 7 day minimum cancellation to avoid cancellation fees. Our company operates on the traditional Honor System, but we kindly ask that all cancellations be made minimum 7 days in advance so we can rebook your service and your reserved driver does not lose work for that day. * You will be surrounded by beautiful places, be sure to bring your camera!